Many changes within the face occur as a result of the aging process. The majority of these changes are a result of the soft tissues of the face losing its elasticity and volume. This results in a sagging of the jawline (jowls) as well as folds of skin and fat in the neck. Facelifting is a surgical procedure designed to lift the tissues that have descended and remove excess fat and skin creating a fresh and more youthful appearance. Since areas of the face are in harmony with each other, this procedure may be combined with a midface lift, necklift or eye/forehead rejuvenation procedures to produce the most natural-looking results. This is an outpatient procedure and all incisions are placed in inconspicuous areas such as the hairline and behind the ear. In order to get the best possible results, it is important to choose a surgeon that is fellowship-trained and board-certified to perform these procedures. A consultation with Dr. Ezzat will determine which procedures are best suited for you to achieve the look you want. Collagen and elastin within your connective tissues naturally diminish with age. Within the cheek, the fat and skin descend from the malar eminence (the cheek bone) starting in the late twenties and early thirties and contributes to the early-aging look most men and women begin to notice in their 40's and 50's. Also referred to as a cheek lift, this procedure targets the midface, as Dr. Ezzat will reposition the cheek. Offering a shorter recovery time than a traditional facelift and greater results than injectable fillers, a mid-face lift provides restored volume to the cheeks and a fresher appearance. Aging is not only limited to the face, loss of elasticity also occurs in the neck. This leads to sagging skin and fat under chin as well as banding of the neck from the underlying muscle. In addition to the traditional neck lift procedure involving incisions behind the ear and a small one under the chin, Dr. Ezzat performs the minimally-invasive web necklift. This involves less dissection and a quicker recovery time from the traditional approach. You can view Dr. Ezzat's journal article describing the technique. A brow lift is a surgical procedure in which the skin of the forehead and eyebrows are lifted to correct the tired, sagging look of an aged forehead that is a result of the effects of gravity over time. There are many ways to lift the forehead; the most common being an endoscopic browlift. This is done using small incisions and cameras to elevate the tissues. While this avoids larger scars and can involve a quicker recovery, not everyone is a candidate for this type procedure. 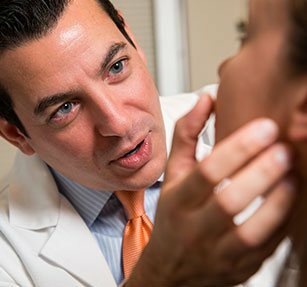 Dr. Ezzat works with each patient to decide which approach is best given their unique facial features, hairline and goals for surgery. "The difference in my appearance is subtle yet powerful in ways beyond the aesthetic."